Goldenrod is the beautiful, native flower covering our fields and meadows in yellow this time of year. However, as the blooms fall, you may notice that some of the Canadian goldenrod (Solidago canadensis) has round swellings on some of the stems. 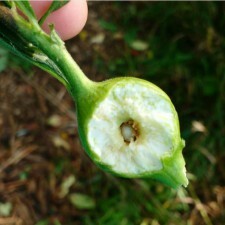 Those round swellings are galls produced by goldenrod gall fly (Eurosta solidagnis). The female flies begin the cycle, in spring, by selecting the best golden rod using chemical sensors on her feet and antennae. Once she has selected a stem, the fly with deposit a single egg, then move along the stem laying another and another… Normally only one of these eggs will survive and produce a gall. After a few days the eggs hatch and out emerges a round larvae that feed on the inside of the stem. While feeding, the larval fly saliva mimics plant hormones, causing the plant to change its growth pattern. Specifically, saliva chemicals cause increased cell production at the site of feeding leading to the formation of a noticeable gall a few weeks after hatching.The gall has a hard outer shell filled with softer nutritive tissues that the fly larvae eat. The gall can grow to the size of a golf ball and turn slightly red by the end of the season. In late autumn, the mature larvae are getting ready to emerge. It will chew a tunnel to the surface of the gall, but remains under a thin layer of cells for the winter. Once it pupates in mid spring, it has no mouth to chew its way out. Instead the fly inflates a balloon-like structure between the eyes to push open the thin cell layer. Once out, for the two weeks it is alive, it will mate and begin the cycle again with the laying of eggs!